This picturesque mile-long city beach has an accessible play area, sand volleyball, and a restaurant with patio seating overlooking the beach. Cabrillo Beachway •Trailhead: Milpas Street at East Cabrillo Boulevard •Length: 1-2 total miles •Typical Width: 4 ft. & above •Typical Grade: Level •Terrain: Hard Accessibility: •Beach Wheelchair: Yes •Available from the Adapted Programs division of Santa Barbara Parks & Recreation, in the Cabrillo Bathhouse. They can be reserved Mon.-Fri., 8 am-5 pm, weekends 11 am-4 pm; call (805) 564-5421. If you have a secured way to transport it, a chair can be taken to other nearby beaches. •Accessible Parking: Yes •At both lots serving the Cabrillo Pavilion Bathhouse. Fees with disabled parking placard are 50 cents an hour, $4 maximum. •Accessible Restroom: Yes •Restrooms at the Cabrillo Bathhouse have old fashioned foot-operated toilet flushes. 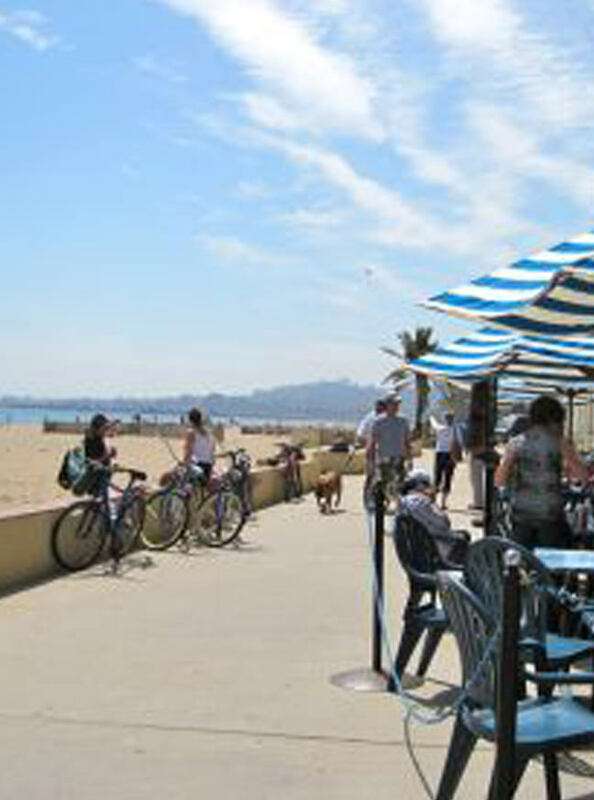 Other nearby accessible restrooms are behind the Santa Barbara Visitor Center at Garden Street and Cabrillo Boulevard, and at the foot of State Street by the entrance to Stearns Wharf. •Accessible Picnic Tables: Yes •Next to volleyball courts •An electric shuttle runs along the waterfront from the harbor to the zoo, 10 am-6 pm year-round; see the Metropolitan Transit District for schedules.